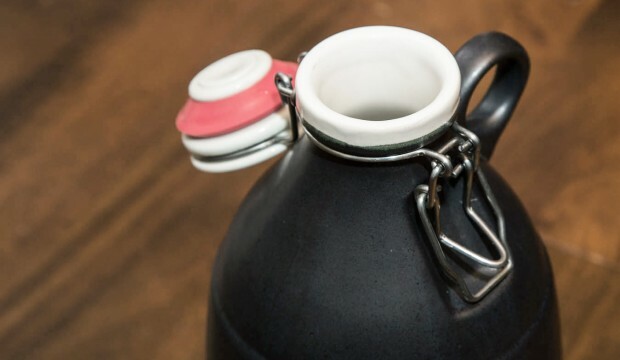 Whether you are serving up beer, cider, mead, or wine, a growler is a great vessel to transport a nice helping of drink for you and a couple friends… Well, maybe just one friend. Here is a list of some of the most interesting growlers available for purchase around the web today. Let me know if you any other suggestions. This is an interesting glass growler. A nice departure from the ubiquitous jug design. It harkens back to a more ancient time of merriment. A nice nod to the history of mead drinking. The design is nice, but I feel as though the handle is out of proportion. Deschutes Brewery has a similar design with a goofy, but better weighted handle. At $10 less than the glass growler with metal handle, this one is a great deal. It has the same unique shape and sturdy construction. The only complaint that I have is the size of the handle – then again I have rather large hands (some have even called them freakishly large). Simple and elegant stainless steel growler without any in-your-face branding. It will keep your libations colder than the traditional glass growler, and it is far more durable. It really has a simple yet perfect canteen feel to it. I recently got one of these at Trillium Brewing Company in Boston, MA. They offer up short runs of unique craft beers, so they sell their highly sought after, high ABV beers in the 32 oz “Growlette.” A great idea, especially for mead which tends to come in at higher ABV than beer. 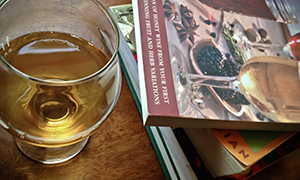 It sort of reminds me of the old glass jars in an apothecary shop – perfect for Metheglin! If you’re the type of hiker or camper that brings craft brews with you (like i do) then you have to get this growler. It’s double wall, vacuum-insulated stainless steel construction keeps your mead, cider, or beer cold after a long, hot hike. It is super durable – ready to be passed around a campfire without fear of breakage. This is another gorgeously designed container. The Wander and Rumble Growler is the first (of many more I hope) product from Shine Craft Vessels out of Virginia. I love the streamlined elegance of the stainless steel growler. While it’s the same size of regular growlers, its form makes it less jug-like and less clunky. Its offered in several, well-selected colors with a finish that makes it look almost ceramic. After a wildly successful kickstarter campaign, Drink Tanks is taking preorders for their innovative new growler. It brings together both ancient and modern growler concepts into a cohesive design that is equal parts functional and beautiful. It’s stainless steel, vacuum insulated with a duel hinge cap. But the coolest part is their “Keg Cap Tap” which turns the growler into a mobile keg system!